What changes will make the 2020 Toyota Avalon different? Expect the usual round of new paint hues and steeper asking prices, but little else as this full-size sedan settles in after a complete redesign for model-year 2019. It returns as a roomy, front-wheel-drive four-door with a choice of V-6 and gas-electric-hybrid power. The Avalon nameplate debuted for model-year 1994 as an enlarged and plusher version of Toyota’s midsize Camry sedan. With staid styling, even a front bench seat, the original set the template for four generations of conservative old-school sedans that appealed to an increasingly elderly clientele. Stylists, engineers, and product planners took Avalon in a different direction for this fifth-generation design. The strategy risked alienating traditional buyers. But with families and aging baby boomers abandoning cars for crossover SUVs, Toyota believed it had to recast Avalon as a high-style choice for younger, affluent shoppers who might otherwise consider cars such as the Acura TLX or Nissan Maxima. Indeed, this is the best-looking, best-driving, and most technologically advanced Avalon ever. But sales have continued trending downward. Clearance deals on outgoing fourth-generation models and some early enthusiasm for the redesigned replacement edged sales up 3 percent for 2019 (against a 15-percent decline for the full-size-car class). But the bottom has fallen out through the first quarter of 2019. Avalon sales are off a sobering 37 percent amid a 23-percent drop for the segment. 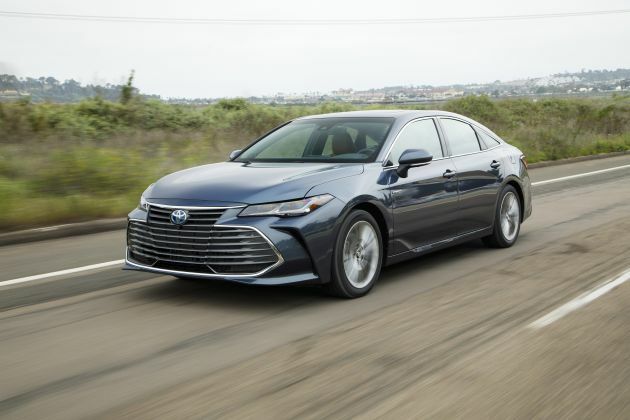 Note that driving impressions and other subjective conclusions in this review are based on road tests of the 2019 Toyota Avalon. In areas where the ’20 might be different, we will reserve judgment. Buy a 2019. It’s extremely unlikely the ’20 will change in any way worth waiting for. So choosing a ’19 would save you from paying more for an essentially unaltered car. 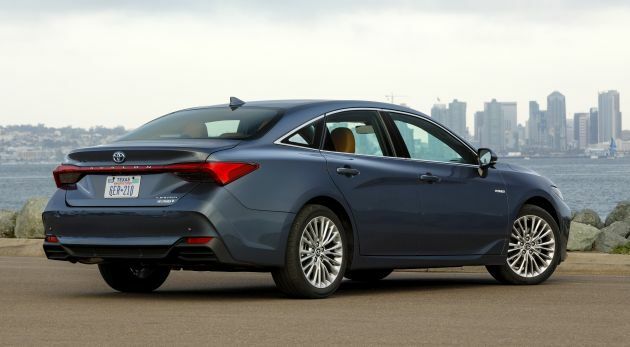 The 2020 Avalon’s lineup should be a repeat, returning base XLE, sportier XSE, upscale Limited, and flagship Touring grades. All would again offer a V-6 engine, with the XLE, XSE, and Limited also available as hybrids that combine a gasoline four-cylinder engine with a battery-powered electric motor. No. The fifth-generation Avalon borrows more than a few styling elements from the Camry and the Lexus ES, the premium midsize sedan from Toyota’s upscale division — both of which outsell it handily. Avalon’s grille and headlights are slightly more conservative, but its fog light cutouts are more sharply defined. The XSE has its own mesh grille insert, blackened exterior trim, and quad chrome exhaust tips. But visual difference between trim levels are otherwise subtle, running mostly to alloy-wheel sizes: 19-inchers on XSE and Touring, 18s on the Limited, 17s the on XLE. All will again come with LED headlamps, with Limited and Touring versions returning with sequential front turn signals. Avalon is 3.8-inches longer overall than Camry and has a 1.8-inch-longer wheelbase (the distance between the front and rear axles). But aside from the front-end-styling differences, the two Toyota sedans look so similar passers-by could be forgiven for mistaking one for the other. Avalon’s cabin design isn’t quite as avant-garde as Camry’s, though. Clear instrumentation will again be highlighted by a central binnacle screen that can be customized to show a variety of data points. The dashboard’s squared-off central control stack puts Toyota’s Entune infotainment system with 9-inch screen at the top. Apple CarPlay is standard, but Google Android Auto was not available for 2019 and may not be for ‘20. With the touchscreen canted toward the windshield, some of the functions can be a stretch for the driver to reach, but Entune overall is responsive and doesn’t take a lot of study to master. Passenger comfort will remain a 2020 Avalon strong point. Front- and rear-seat occupants will continue to enjoy excellent headroom and legroom. One result of the redesign Avalon’s sportier stance is low seating, even with the front buckets raised to their maximum. That, and the compromised rear visibility resulting from the fastback roofline, may well put off some traditional Avalon buyers. There is plenty of small-items storage, thanks to a capacious center console and handy covered bin located ahead of the transmission lever. Trunk volume is near the top of the class, at 16.1 cubic feet. The hybrid’s battery pack steals no trunk space and allows for 60/40 split/folding rear seatbacks, a major plus. No. The ’20 Avalon will continue to share drivetrains and much of its underskin engineering with the Camry and ES. Their common foundation is the Toyota New Global Architecture (TNGA), which underpins an increasing number of Toyota and Lexus cars and crossovers. It’s a well-designed platform that contributes to a level of driving sophistication previously absent from vehicles from these brands. Indeed, the ’20 Avalon should again feel composed on the road, with excellent steering feel and little body lean in fast turns. If not exactly sporty, it’ll again handle sudden changes of direction with relative aplomb, which should provide some welcome reassurance for newcomers and traditional Avalon buyers alike. The tradeoff is a notably firmer ride than previous-generation Avalons. That’s true particularly of the XSE, which combines a tauter sport suspension with its low-profile 19-inch tires. Touring grades will again have an adaptive variable suspension that automatically adjusts firmness based on road conditions. It’s still taut but should be more tolerable to most buyers. Again powering gas-only versions of the 2020 Avalon will be Toyota’s corporate 3.5-liter V-6 engine with 301 horsepower and 267 pound-feet of torque. It’ll team with a slick-shifting 8-speed automatic transmission. Acceleration is smooth and strong, even with the drive-mode selector in fuel-saving “Eco” mode. It’s also very quiet, so much so that XSE and Touring models pump in simulated exhaust noise through the audio system. The trend these days is toward positioning hybrid powertrains as performance-enhancers, not fuel-economy maximizers. Indeed, many hybrid cars and crossovers are now the most powerful models in their lineups. Toyota, however, will continue to hew toward the high-mileage meme with the 2020 Avalon Hybrid. It’ll again pair a 2.5-liter four-cylinder gas engine with an electric motor for a net system output of 215 horsepower. The system automatically chooses gas or battery power, or a combination, for the optimal balance of performance and economy. Avalon hybrids will continue with a continuously variable automatic transmission (CVT). Like nearly all Toyota hybrids, this isn’t a plug-in, instead recharging its onboard nickel-metal hydride battery via energy recaptured automatically during braking and coasting. Torque from the electric-motor assist delivers a welcome kick in around-town driving, and for green-leaning drivers, the markedly lower fuel consumption is a reason to choose it over the V-6. But where the V-6 is silken and furnishes 0-60-mph in just over 6 seconds, the Hybrid’s four-cylinder/CVT combo can be droning and require an extra 2 seconds or so to reach 60 mph. Probably not. With no powertrain changes, 2020 Avalons should repeat their 2019 EPA ratings. That means the V-6 models would remain competitive with sedans of similar size and power. The 2020 XLE should repeat at 22/32/26 mpg city/highway/combined, with the other V-6 grades at 22/31/25. Our Touring review sample returned a solid 24.6 mpg with more highway driving than city use. The 2020 Avalon Hybrid should remain among the most fuel-efficient car its size. Expet the 2020 XLE to reprise 2019 ratings of 43/44/44 mpg city/highway/combined and the XSE and Limited to again rate 43/43/43 mpg. All ’20 Avalons would agaom use regular-grade 87-octane gasoline. Possibly. Toyota could add some currently optional equipment to the standard column, but we wouldn’t advise delaying a purchase based on this. The lineup comes reasonably well equipped anyway. All grades include Toyota Safety Sense P (TSS-P), which is a suite of driver aids that includes forward-collision warning with pedestrian detection, lane-departure warning with automatic steering correction, automatic high-beam headlights, and adaptive radar cruise control that can maintain a set following distance from traffic ahead. Also standard is Toyota’s Safety Connect telematics and blind-spot alert with rear cross-traffic detection. Front- and rear-obstacle detection with rear automatic braking and a 360-degree surround camera system are optional on the Limited and Touring and unavailable on the XLE and XSE. Note that Hybrid models mirror their conventional counterparts for feature availability. Included on the XLE are LED daytime running lights, dual-zone automatic climate control, heated front seats trimmed in Toyota’s SofTex imitation leather upholstery, and four USB charging points. In addition to its appearance and suspension upgrades, the XSE gets wireless smartphone charging, power sunroof, sport bucket seats with a SofTex/suede blend, and genuine aluminum interior trim. The Limited has full LED exterior lighting, genuine leather upholstery, ventilated front seats, power front-passenger seat, heated outboard rear seats, heated power tilt and telescopic steering wheel, imbedded GPS navigation, and an upgraded JBL-brand audio system. Touring grades have the electronic suspension, extra Sport + drive mode that further quickens throttle response, and SofTex/suede upholstery. Expect only a very slight base-price increase, probably less than $1,000. For reference, here are 2019 Avalon base prices, including the $930 manufacturer’s destination fee. For V-6 models, the ’19 XLE started at $36,480, the XSE at $38,980, the Limited at $42,780, and the Touring at $43,180. For hybrids, base prices were $37,480 for the XLE, $39,980 for the XSE, and $43,780 for the Limited. Toyota isn’t apt to expand Avalon’s fairly limited options. Certain paint colors will continue to cost about $395. XLE models should continue to offer a power sunroof ($1,000). XLE and XSE would have a $680 JBL audio upgrade. Limited and Touring grades would have the $1,150 Advanced Safety Package that adds the surround view camera, rear emergency braking, and obstacle detection. Expect a 2020 Toyota Avalon release in fall 2019.